Love Your Neighbor is a concise introduction to Christian ethics. It begins with a look at the biblical basis for morality, defines and describes various philosophical approaches to the subject of ethics, then connects biblical morality with the idea of absolute truth in philosophy. The book then moves from its philosophical basis to a practical application of Christian ethics, considering a wide range of social, biomedical, and personal issues. It does not take a partisan or denominational approach to these issues, but squarely faces them with an open mind and open Bible. The book is based on sound biblical and philosophical reasoning and does not tell readers what to think but encourages them to think biblically and critically through these issues. "I've never seen a single book that covers the waterfront of ethical issues in a biblically faithful way at a level available to high school readers. That is, until now. Love Your Neighbor is clear, concise, broad, biblical, and readable." "Those who are looking for simplistic answers will not find them here; those willing to grapple with both the Bible and real life will welcome this opportunity to think carefully about the choices that confront us every single day." "Though they tackle head-on the key philosophical questions, Geisler and Snuffer write in a style that will be easily understood and greatly appreciated by youth and adults alike." "Geisler and Snuffer show how the triune God and 'the greatest commandment' help us navigate through the array of difficult questions that challenge us today. Students will find this resource both helpful and accessible." "Addresses the great issues of our day from a distinctly biblical position. How encouraging to see subjects like lying, cheating, and stealing addressed once again, to say nothing of the more obvious issues that most people think about." 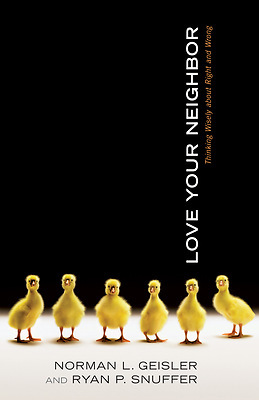 "Love Your Neighbor avoids telling us what to believe or how to behave in any given situation, but presents clear guidelines to help us determine where the high ground can be found."